Here is my growing Eve Vegas 2013 photo album for this trip. I'll be adding to it daily. I found myself pleased as could be, announcing to my corporation that I had acquired a large plush dragon during a pit stop between exploring and going out. I also have a candy apple. Also, I am playing a mild., low bid game of "Find the Eve Player". But, let me wind back the day. I woke up around 0730 bright eyed and awake. At home it would be 1030 so my inability to return to sleep is understandable. I wrote instead until the husband awake and we descended upon the Rio's buffet for breakfast. It is the largest buffet in Vegas or so the various things go. I was able to fill up on fruit and kielbasa before we ventured off to the strip to walk around. I had shopping objectives. Last year I purchased a particular, novelty shirt for my husband during Eve Vegas. It quickly became his favorite shirt. Sadly, about three months later it was torn by a protruding bit of wire somewhere. We went out to replace it. Ahh Vegas. During the day it is a different place. The sunlight takes away all of the glamour. There is a hotel going up beside the Flamingo and the construction stuff is everywhere. Still, it is a fascinating place. I find Ceasar's Palace particularly enthralling to look at. Some of that is due to me having a fascinating with highly stylized architecture. The streets are filled with people trying to get you to go to shows, take their cards about strip clubs that are oriented at couples. They try to shove things into your hands and you find yourself dodging them while taking a picture of Chewbacca after he scares a dude coming around a corner. We picked up tickets to an actual show. That makes it the second one I have attended. We have tickets to a third show as well, for Sunday. But tonight, we had heavily discounted tickets to see Divas. It is a show of drag queens intimidating female singers. I really liked the looks of it. It seemed more fun than serious so we got the tickets and finished our adventures. 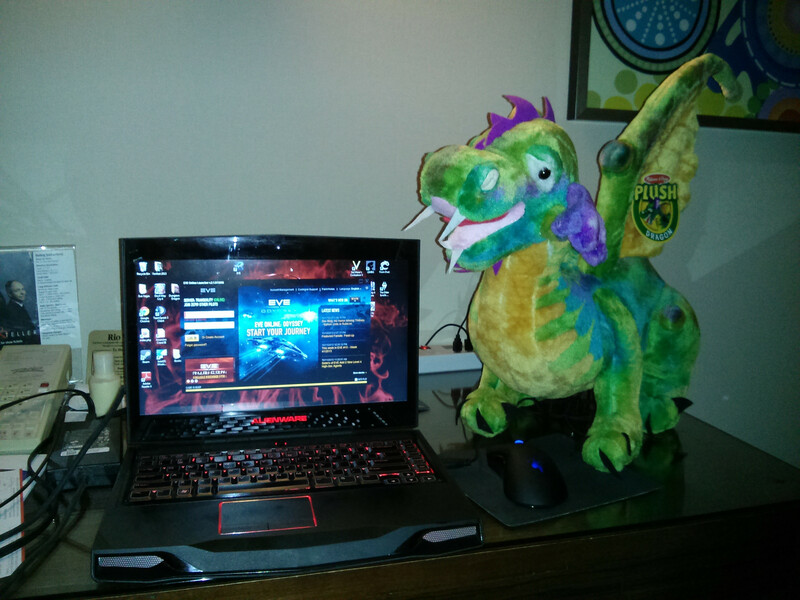 That is how I acquired my new dragon and a candy apple. Excalibur has a Dragon Store in it. I wanted some more shirts. Last year, I saw the plus dragons. When they were still there I was over come by need. I like stuffed animals but managed to never get into collecting them. Sometimes I do give in and pick up interesting pieces. And plushie dragon over there is interesting. It involved a lot of walking. I also had to avoid the mostly naked man for the Thunder from Downunder dancing men attraction that they have. The men like to call out to women and try to entice them to the show. I'm a firm believer in saying "No" before I even know way the random stranger wants my attention and I am not to proud to dodge and run away. We cheated on the way back and took the Monorail to Ceasar's Palace so that we could go to Gordon Ramsey's Pub. We're Ramsey fans and completely ate the bait hook line and sinker. Fortunately the food was good with him getting shepherds pie and me finding a lamb burger to indulge in. Fat and happy we found the shuttle back to Rio and showered and changed for the show. Before anyone gets too excited understand it was just fresh jeans and t-shirts. Back through the hotel and off to wait for the shuttle. The free shuttle is super nice but it is also a bit of a wait sometimes. The crowds start to creep in and the desire to fight for ones position in line is tremendous. I managed not to punch anyone in the face, entered the shuttle safely, and back out we went. Drunk crowds of aimless tourists are really a hazard. You can't judge what they will do. They look as if they are going left and you dodge right only to slam into them as they stare at you confused at how you got there. We made it to the show which turned out to be excellent. I am not overly familiar with going out to see something like that. It was a lot of fun. I won't ding the show for the man at our social table who kept releasing ear piecing whistles of approval with each performance. I then promptly got lost in the hotel trying to get back to the shuttle pickup. That is how I wound up outside, in the loading docks, walking around Harras, annoyed. The hotels are huge. It is ridiculous. I must do some recon tomorrow to figure out where the hell I am supposed to be going. Today's post fueled by a candy apple.